and Rémi Gribonval, Directeur de recherche, Inria, Rennes. This release includes bug fixes and updates (easier deployment and use, new separation examples, updates related to third party libraries, IDE/compiler related updates). A release note is available on the website for more details. Please note that this release will be the last under QPL license. Future ones will be released under Inria license, remaining free for academic research purpose. For all other uses, you will be invited to contact Inria to discuss modalities for a commercial license. Those next releases will include CPU/RAM consumption improvements as well as block processing approaches. In case you have any trouble and want to contact a human being, you can send an email to fasst-support@inria.fr. We will do our best to answer quickly (we like feedback too). Speech Communication is a joint publication of the European Association for Signal Processing (EURASIP) and the International Speech Communication Association (ISCA), covering various areas of speech communication science. Its primary objective is to provide thorough discussion and rapid dissemination of basic and applied research results. Approx. 300 manuscripts are handled per year, among which 30 % are published with an average review speed of 18 weeks. EDF and the French Academy of Technology awarded the 2017 Paul Caseau Ph.D. prize to Luc Le Magoarou for his work on “Efficient Matrices for signal processing and machine learning” conducted at ’IRISA (PANAMA team) under the supervision of Rémi Gribonval. Code release: FAuST 1.1 for Approximate Fast Graph Fourier Transforms. FAµST is a toolbox useful to decompose a given dense matrix into a product of sparse matrices in order to reduce its computational complexity (both for storage and manipulation). Such matrices can be used to speed up iterative algorithms commonly used for solving high dimensional linear inverse problems. 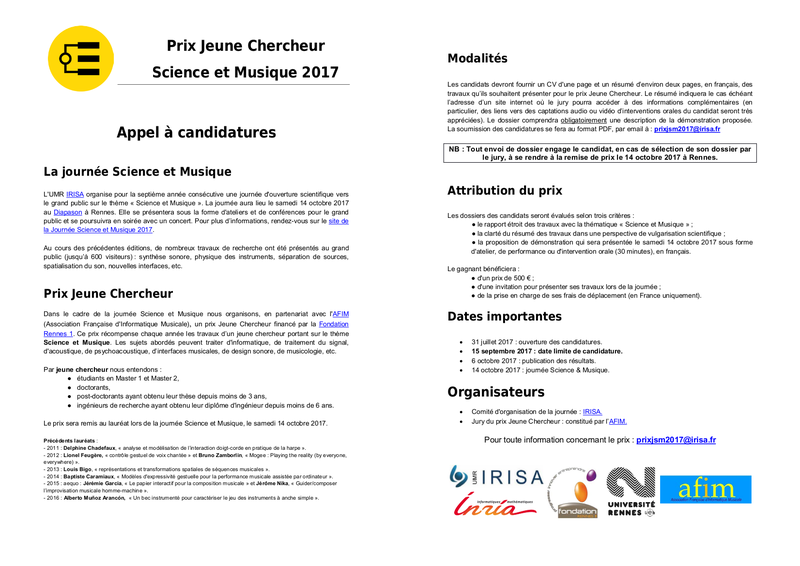 Applications to the seventh “Young Researcher Science & Music Award” can be sent from July, 31th to September, 15th. The award ceremony will take place during the “Journée Science et Musique“, on October, 14th, 2017. You will find the full call for participation below.